Expobar super professional espresso coffee machine that meets the highest barista standards together with the requirements of the very demanding coffee drinking market. 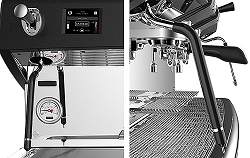 The Diamant Pro has beautifully designed, featuring a main TFT & group Oled’s displays, a reinforced hydraulic system and a new electronic platform to perform a superior in cup quality, even in the hardest and busiest situations. The 3 group multi boiler version is equipped with a 17.5 litre steam boiler and 3 independent 1.5 litre group head coffee boilers. As options, the machine can be equipped with the Crem Tech SmartSteam, a cup warmer or wifi module to control the machine via app. 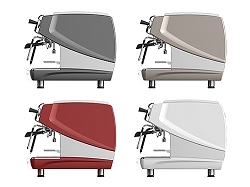 Diamant Pro versions are set with tall espresso groups with fold-away cup trays for smaller cups (Take Away). Expobar super professional espresso coffee machine that meets the highest barista standards together with the requirements of the very demanding coffee drinking market. The Diamant Pro has beautifully designed, featuring a main TFT & group Oled’s displays, a reinforced hydraulic system and a new electronic platform to perform a superior in cup quality, even in the hardest and busiest situations. The 2 group multi boiler version is equipped with a 11.5 litre steam boiler and 3 independent 1.5 litre group head coffee boilers. As options, the machine can be equipped with the Crem Tech SmartSteam, a cup warmer or wifi module to control the machine via app. Diamant Pro versions are set with tall espresso groups with fold-away cup trays for smaller cups (Take Away). Expobar super professional espresso coffee machine that meets the highest barista standards together with the requirements of the very demanding coffee drinking market. The Diamant Pro has beautifully designed, featuring a main TFT & group Oled’s displays, a reinforced hydraulic system and a new electronic platform to perform a superior in cup quality, even in the hardest and busiest situations. 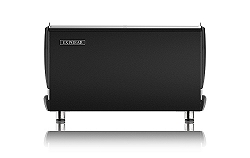 The 3 group version is equipped with a 17.5 litre steam boiler. As options, the machine can be equipped with the Crem Tech SmartSteam, a cup warmer or wifi module to control the machine via app. Diamant Pro versions are set with tall espresso groups with fold-away cup trays for smaller cups (Take Away). Expobar super professional espresso coffee machine that meets the highest barista standards together with the requirements of the very demanding coffee drinking market. The Diamant Pro has beautifully designed, featuring a main TFT & group Oled’s displays, a reinforced hydraulic system and a new electronic platform to perform a superior in cup quality, even in the hardest and busiest situations. The 2 group version is equipped with a 11.5 litre steam boiler. As options, the machine can be equipped with the Crem Tech SmartSteam, a cup warmer or wifi module to control the machine via app. Diamant Pro versions are set with tall espresso groups with fold-away cup trays for smaller cups (Take Away). Automatic steamer solution with an integrated temperature probe. Polymer based coating to decrease the temperature approx. 20ºC Crem TechTM SmartSteam functionality: double function lever for easier & faster flushing; adjustable temperature & foaming levels through the main TFT display; auto cleaning system: adjustable in secs per rinse and time from last use. Cup warmer with an independent heating element underneath the top panel of the machine that heats the cup up to the desire temperatura.